The institution known as the Oraculus splinters, sundering the Seven Sages. Now, each lone sage decries the others as frauds and proclaims unique revelations of future eras - a future that whispers back secrets of great power! Are these visions true, or are they insidious dreams? Discover the latest imaginative adventure from the master of d20 psionics! 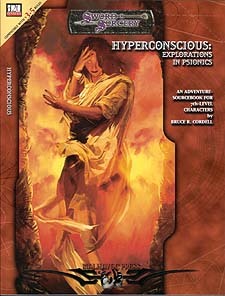 During play, Hyperconscious: Explorations in Psionics unveils valuable game material, including new psionic prestige classes, powers, monsters, feats, and items - many based around the themes of Dream. Plus, discover more about the horrifying entity known as the Dark Plea and its latest machinations. Hyperconscious also updates all the psionics rules material from Malhavoc Press' EN World Award-winning previous psionics books, If Thoughts Could Kill and Mindscapes, to v.3.5 of the d20 System. This material is now fully compatible with the Expanded Psionics Handbook - and Hyperconscious is the only place you can find the updates and the new adventure all in one convenient volume. Bruce R. Cordell, designer of the D&D Psionics Handbook and Expanded Psionics Handbook is also known for his Origins Award-winning Return to the Tomb of Horrors and Epic Level Handbook.